This is no ordinary Apple launch — it’s not introducing the sixth version or the fourth version of an iPhone or iPad. It’s not a mystery as to what category this new Apple product is in: It’s a watch. Not a standard watch, by any means. 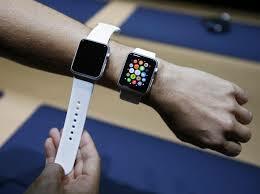 But it is still a watch — but beyond any other watch on the market today, so Apple hopes. Apple has done what Apple does best — launch new products. And they have recruited an incredible team of branding, retail, and technology experts to support the Apple Watch launch. For example, their retail division has been going through a major in-house restructuring since the Sr. Vice President Retail Ron Johnson left for JC Penny in 2012. Apple enticed Burberry’s highly regarded and electric Angel Ahrendts to come in as Sr. Vice President to head all retail and online sales efforts, which is causing the reported departure of long-time Apple retail executive Bob Bridger. To get the high-powered Ahrendts, Apple made her an offer she couldn’t refuse — more than $39 million in stock grants to leave Burberry plus, plus, plus..
To bolster their bet on the Watch, two of Apple’s key acquisitions last year was the hiring of Tag Heuer’s vice president of sales, Patrick Pruniaux in April and the head of French fashion brand Yves Sant Laurent Paul Deneveto who will work on special projects. The forthcoming Apple Watch launch on Friday, April 24, (pre-orders will begin April 10) is expected to produce another record quarter for Apple, although sales estimates vary all over the field, Fortune Magazine conducted a survey last September and the analysts’ predicted from 8 million to 41 million for 2015. The average was 2.5 million per month. That blows past any watch sales record (of any type). 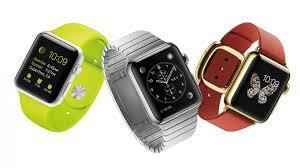 Initial estimates from Apple was an order of 5-6 million watches. Apple has already announced that all of their stores will be modified for the integration of “wearable technology” with the Apple Watch stimulating a ‘re-think’ on how Apple stores will be configured to sell the Watch which goes from $349 to as much as $17,000+. What doe this all mean? It means simply that Apple put their $$ on proven stars in the luxury brand category — Burberry, Tag Heuer and Yves Saint Laurent….bringing seasoned leadership to the Apple brand. This is, indeed, an impressive array of brand talent. After all, Apple is also perceived as a luxury brand. On the Watch technology front….Apple has opened its first new product to app developers since the company introduced the first iPad five years ago….and Apple is hoping there will ‘thousands of great apps’ by the April launch, and there are more sure to follow. The Apple Watch is not unlike other smart watches from Samsung, Google and others. The Apple Watch, however, stays connected to your iPhone so it can retrieve information, receive notifications like texts and emails, and can be patched through to make and receive phone calls as it has speakers and microphones. It’s also a fitness tracker with heart-rate measurements….it plays music….had bluetooth for earplugs and headphones…makes payments via Apple Pay and can even be a remote for connected smart-home appliances. The software development kit released last year allowed app makers to work on creating “different” apps than would be found on other already-in-the-market smartwatches. Their complaints is that they have been given guidance along the way — some express frustration in Apple’s handling of the app market. And, oh, yes — you will need an iPhone — 5, 5C, 5S, 6 or 6 Plus. Earlier iPhones are excluded. What about the feel, touch, look? Reviews clearly demonstrate that the new Watch is elegantly designed, handsome on your wrist, user friendly and a “let-me-show-you-my-new Apple Watch!” You can quickly imagine that Apple Watch users most likely won’t be wearing long-sleeved shirts — they’ll want to show off their new toy. This is, after all, a “luxury branded product” — and if you’re rich enough for the solid gold Apple Watch, it will be the topic of many conversations with “interested” friends, even if they’re not interested. But they will be. Overall, the design and technology appear to be moving to the top of the ‘approval ladder’ from technologists who have followed this wearable technology sector and actually had one on their wrist. The Apple Watch uses haptic feedback via what it brands a “taptic engine” that feels like more advanced and subtle vibration. It also has a force-sensitive display: press harder, and it will do different things. This could mean more advanced types of notification buttons, or control input. Apple’s newest MacBooks use this same combination of “force touch” and haptics to simulate clicking, and it’s astonishingly effective according editors of CNET. At this point, there are many unanswered questions — is the 18-hour battery life real or fiction? Will apps transform the watch beyond what competitors are already offering? Does it make the iPhone better? Will it be easy and fun to use as Apple wants it to be? Will it stand on its own merits?